Today, I’m taking a look at one of my all-time favorite real life players — Carlos Tevez. ‘El Apache” received a 95-rated Classic Hero item as part of the ongoing Festival of FUTBall promotion. It’s a item that is a throwback to his sensational FIFA 15 TOTS item, a item which, at the time, was game-breaking. I used the Hawk chemistry style on him, to max out his Pace, Shooting and Physicality. I used Tevez for 13 games — in 10, he was on 10 Chemistry, and in the remaining three, he was on 8 Chemistry. He’s rapid. The combination of a low center of gravity, great Dribbling and a high Pace stat make him feel unbelievably quick in game. He can burst away from defenders like it’s nothing, and once he hits top speed, he’s uncatchable. I love his pace. One of the best finishers I have used this year. His positioning and finishing are immaculate, and the runs he makes are sensational. The only caveat here is that you will have to trigger the runs — the workrates aren’t conducive to auto-runs — but when you do, oh boy are they good. His shot-power is crazy (the best I’ve used this year), and he’s a handy man to have around for volleys (I scored three bangers with him). A very competent passer, with no glaring flaws. He can do the short- and medium-range passes without any difficulty, but his long passing is hit and miss. However, his crossing is fantastic, and as a quick striker, it allows him to drift out wide and ping beauties into the box. Sensational. The ball sticks to his feet, he stops, starts and turns instantly, and his dribbling animations are on point. I love the way this item feels on the ball. He’s unstoppable when he gets going. As an attacking player, you don’t need him to defend. That being said, he does it anyway, and he’s ridiculously good at it. High pace, great agility and sensational strength, stamina and aggression means he can track down any opposition player, and force the ball off them. Its a wonder to behold. He’s so powerful in game. His strength and aggression combination make him one of the strongest players in the game, and impossible to bully on the ball. He’s the only player in the FIFA 18 core game to have 95+ Stamina, Strength and Aggression, and they combine in game to make him the bulldog he was in real life (the short, stocky build really helps too). The only downside is his jumping, but it’s made up for completely by his power in game. As you can see, he’s almost perfect so far. But is he one of the best players in the game? Yes. But he’s far from the best. What hurts this item for me is the three-star/three-star combo. Keep him on his right foot, and he can beat anyone. On his left, he’s still sensational, and he gets the job done, but he’s far less effective. It does feel more like a four-star weak foot, but it’s still not perfect. The big downside is the three-star skills. It stops him from being unpredictable in-game — your restricted to the simpler skill moves (though ones like the roulette and ball roll and still incredibly effective with this item), and forced to rely heavily on his dribbling ability. Thanks to his high agility and balance, he’s incredible good at fake shots and changing direction, but without the four-star skills, he lacks that flair and explosiveness that I love in my attacking players. If he didn’t have the strength and aggression that he has, or if his pace and dribbling were lower, this item would be really hard to use. Fortunately, he has the stats to make up for it. I love this item. If you ignore the three-star/three-star combo, he’s one of the best strikers in the game. If you rely on the skills and weakfoot (like I do), this item takes some getting used to, but when you do, he’s a force of nature. 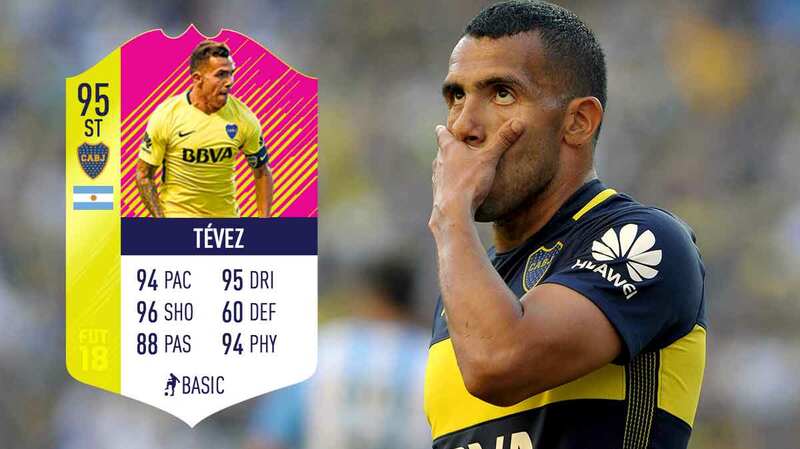 Forget all the complicated and fancy stuff — Carlos Tevez takes you back to a time where you just had to kick hard and run fast, and my god, he’s good at those.